I just go out there and sing 'em. I don't try to get anybody to listen." This film cuts across genres and stands as a landmark achievement of cinema. For the Dylan fan it is an essential depiction of the youthful folk singer touring England with his one-man roadshow featuring songs of love, loss, redemption and pain. Although truth with Dylan is a hall of mirrors, there is a truth to be had here about art and stardom. Director D.A. Pennebaker virtually invented a style of film with Dont Look Back and this movie is constantly cited as the beginning of a way of visually representing life on film. Such an artistic naïveté seems hardly possible in our cynical age, after having been manipulated by various media in so many ways, we can not be blamed for refusing to take any piece of "history" as being true or even very close to true. Pennebaker does a marvelous job of piecing together an interesting sequences of scenes that range from the sublime to the ridiculous. Hw gives us the fascinating core of Dylan's entourage as they interact with the consistently delightful and bizarre characters they encounter as Dylan plays theaters and music halls around England. Friend of Dylan, Bob Neuwirth, is the road manager; Joan Baez, mentor and fellow folk singer, is along for the ride; Alan Price, recently with the rock group The Animals joins the group and the father figure of all is Dylan's manager, Albert Grossman. They have some great scenes with "the High Sheriff's lady" who Bob gives a harmonica; "the Science Student" who engages Dylan in a very humorous dialogue about the nature of existence; Albert negotiates the price of an appearance on TV with the sneaky Tito Burns and English folksinger Donovan hangs out with the gang. "Who is this Donovan?" Dylan is heard saying early in the film. The first scene is the arrival of Dylan's group in England, which leads into a hilarious press conference as Bob patiently deals with a press corps that does not quite know what to make of him. Pennebaker inserts himself as a fly on the wall and we see Dylan writing at his typewriter while Joan Baez sings Percy's Song (a song written by Dylan but never released on an official album until 1985's Biograph). Then Bob takes to his guitar and we are treated to a duet with Baez on Hank Williams songs. In one riveting scene, Dylan composes a song at the piano. We sit with him as he nervously waits in small rooms before going on stage. There are some poignant moments as we watch from the door as Dylan steps through and into the spotlight to the delighted applause of the audience. And of course, we have bits and pieces of some of Dylan's greatest early '60s material. All I Really Want to Do, Only A Pawn in Their Game, The Times they Are A-Changin', To Ramona, The Lonesome Death of Hattie Carroll, Don't Think Twice, It's All Right, It's All Over Now, Baby Blue, Talkin' World War III Blues, Gates of Eden, It's Alright, Ma (I'm Only Bleeding) and Love Minus Zero/No Limit are among the songs, and so crystalline and compelling are Dylan performances, that we feel an immediate lurch when most of them are truncated. 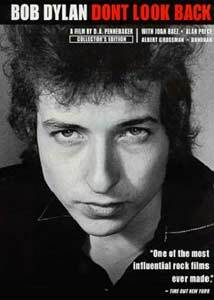 In the accompanying handbook, Pennebaker is quoted: "I assumed, by mistake as it turned out, that the songs Dylan sang on stage would always be available on records. I did not want to make a concert film—which up to that point, had not been invented. I wanted to watch Dylan creating himself and to only show him performing when that seemed to carry the story along. It was a story film, not a musical." Pennebaker does a magnificent job of taking these disparately filmed pieces and putting them together into something that is whole and ultimately as satisfying as drama. Engrossing and entertaining, this DVD is essential to collectors of many genres. For someone collecting the great rock documentaries such as Gimme Shelter or Woodstock, this film is essential both as a progenitor of those films and as a singular depiction of a musical force that many acknowledge as one of the most powerful of the 20th Century—Bob Dylan. For the student of film history, this is the beginning of American cinéma vérité and although it lead to so many poor imitators, this film set a standard of heightened realism that few films have ever matched. In our times, Bob Dylan has achieved an unbelievable status as a musician. He has received Kennedy Honors from the President; the Polar Prize from the King of Sweden; played for the Pope on a recent tour; won Male Rock Vocal and Album of the Year awards at the Grammies® in 1999; received a lifetime achievement award from the Grammies® prior to that; was recently under Nobel Prize consideration AND continues to tour the world to great acclaim and appreciation from long-time and young fans alike. Has there ever been an artist as comfortable playing the Shrine Auditorium in Billings, Montana as he is playing before Popes, Presidents and Kings? This film captures a multi-layered portrait of a young Bob Dylan at a crucial time in his career and our own musical history. It is hard for us to remember those days in the '60s without the mass media we know today. Dylan did not release any of his concerts on record until 1970 (5 songs from the Isle of Wight concert) and then in 1974 with the release of Before The Flood (a document of a tour with The Band.) By 1965, Dylan had released only four albums! The soon-to-be-released, ground-breaking electric album Bringing It All Back Home is heard in the background in some scenes of Dont Look Back. The world of music was never the same after Dylan united the social conscience of Woodie Guthrie with the "wompbompbaloobop" of Little Richard. This is a recommended DVD for students of music and our cinematic heritage. Image Transfer Review: The picture quality is certainly as good as one could reasonably expect from a film that is 35 years old and shot under some of the conditions described by Pennebaker in the audio commentary. One has only to take a quick look at the alternate take of Subterranean Homesick Blues to see the care that was taken in making this digital transfer. As is the case with many sources of such age, the quality emphasizes some of the flaws of the original source material. But, as in the case of the audio, even the flaws testify to the "authenticity" of this film. Audio Transfer Review: The audio is remastered for this release and although Dont Look Back was recorded on-the-fly in varied locations with invented-on-the-spot setups, it is quite serviceable. The stereo is not a factor. There is quite a bit of mumbling and background noise, but this seems to add ambience to the kaleidoscopic look into a few days in the life of a travelling troubadour. The concert sequences are decently recorded and preserved in this version. The primitiveness of the equipment provides a uniquely "analog" quality to the proceedings; a warmth of reality that sometimes is lost in this "digital" age. Pennebaker has received some criticism for truncating some performances and cutting in the middle of songs, but this film is a portrait of the artist and the music is only a part of the complete picture that Dont Look Back paints. Booklet with tour schedule, songlist, quotes and interesting trivia. Extras Review: A nice but not overwhelming set of extras on this release. The alternate take of Subterranean Homesick Blues cue card sequence is so ultimately hipster cool. Bob Neuwirth coolly smokes on a cigarette and Allan Ginsberg takes off his coat, then his sweater and then puts back on his coat as Dylan handles the cards. Bob is less synched with the song in this version but it is still great fun. There is a very nice Profiles section that includes very complete and useful descriptions and information about the principles of the movie. There is a D.A. Pennebaker filmography and a Bob Dylan discography included. The prize of this release for Dylan fans is 5 complete performances from this 1965 tour. It is simply fascinating to listen to the performances with Dylan at his acoustic peak and poised to embark on a totally new career path of electric music and pop stardom. With the recent release of the Live 1966 recordings on CD, it is particularly interesting to compare these acoustic versions with the style he moved on to, only one year later, on another tour of the British Isles. With these plus the wholly enjoyable audio commentary by Pennebaker and Neuwirth, this release definitely qualifies as a "Special Edition." This bit of film takes us back to a time in America when a young boy with a guitar and a harmonica stood up and sang a song about a poor black maid who was killed by a rich white man in Baltimore. It gives a singular portrait of a singular artist in his element—on the road, singing his songs—at the dawn of new musical era. Ground-breaking cinema meets ground-breaking music to record a compelling and entertaining space in time.